We are starting the 21st Edition of Blogging Marathon. When I decided to make different dishes with Moong dal, the inspiration came from the fact that I had a magazine that had some delicious looking Moong Dal recipes. I have been forever planning to make. I don’t understand how I missed having this theme all this while. So when I remembered those recipes, I immediately wanted to have that theme this edition. Only can you believe my hard luck! I misplaced the magazine and have been forever searching for that ever since. The days drew in fast and I had none to make from. 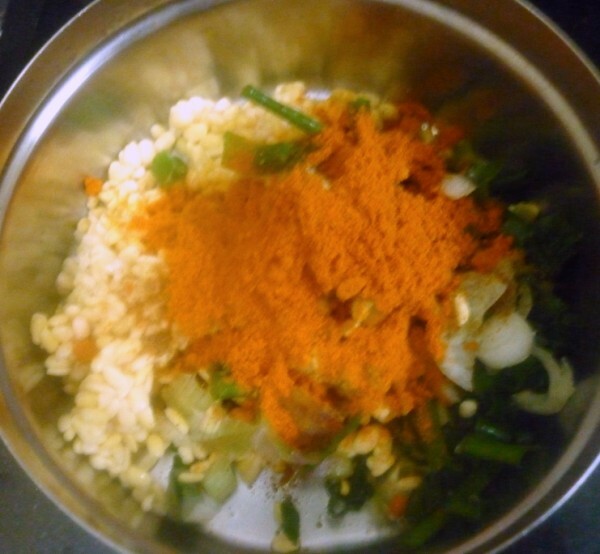 So a fanatical search from my stored recipes lead me to couple of dishes that I hope will satisfy my wish on making moong dal dishes. I hope I lay my hands on that book again, it had such pretty pictures! Coming to the theme, to make it more complicated I decided to have a combo within the them. Guess what, it worked against me, none of the combo I decided was easy enough for myself to make, so I am finally struck up with a theme that makes me scratch my head for ideas. Well I have enjoyed browsing through my records and I hope these do justice to the theme. 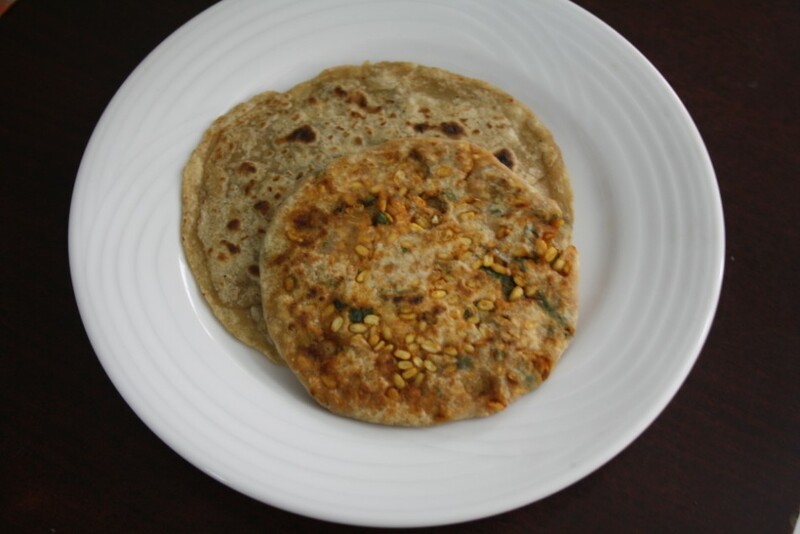 Bermi Parathas are something where Moong dal is mixed with Spring Onions and stuffed in a paratha. I was checking around to see if I can understand what Bermi means and if I can simply avoid the spring onions. The only reference I had were the links to Tarla Dalal and so many others that were simply reproduction of this. And all the recipes invariably had spring onions, so that made an urgent visit to the shop imminent. And not to mention whatever is meaning behind these parathas, we surely enjoyed it. Take the flour in a wide bowl, and knead into a soft dough. Keep it aside to rest for 10 mins. Wash and soak the moong dal for 30 mins, drain the dal and mix in finely chopped spring onions, chili powder, cumin powder and salt. Make small balls of the dough and roll out into discs. 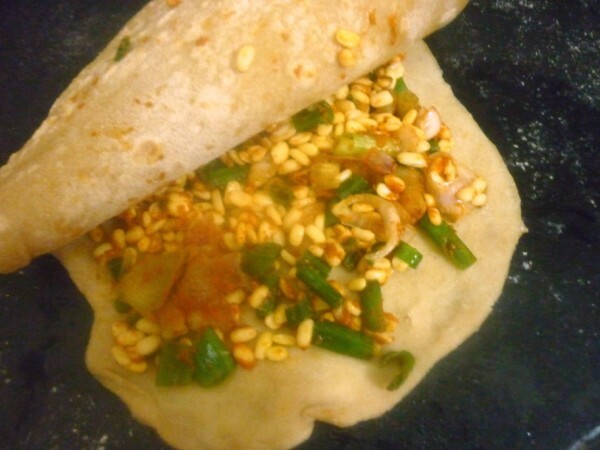 Place just enough stuffing on one roti and place the other and seal well. 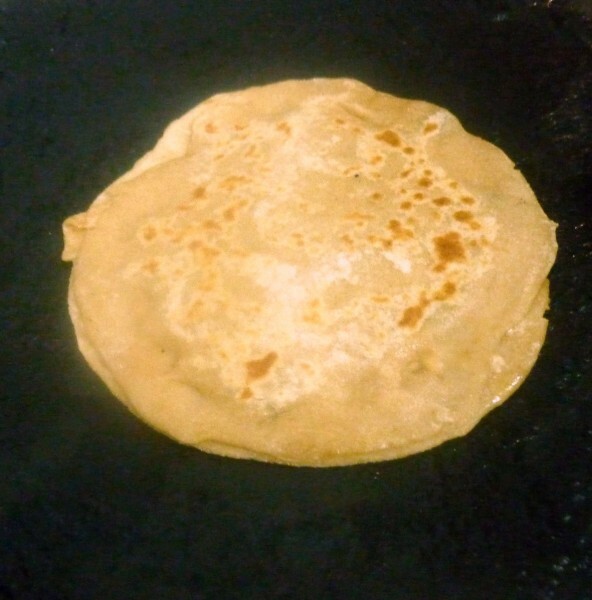 You can make this as the regular stuffed paratha, however with the moong dal still in shape, it becomes hard to roll out properly. very interesting and new dish!! atleast new to me!! bookmarking it!! This parathas looks awesome, never stuffed moongdal like this in parathas, will give a try soon. This paratha is really new to me, bu then mmost of the parathas are new to me 🙂 looks good this one. I love this paratha. Almost a staple at my mom's place. Very new recipe valli !! Filling n healthy parathas!! Never tasted such parathas. Bookmarked it. Looks great. Adding moong dal in parathas is totally new to me. Love it Valli…. Happens all the time na!You look for it and its missing and when you are looking for something else the other one pops up!! wat an interesting name! And unique combination of ingredients for stuffing too. Just wondered, could these be 'burmi' parathas, as in from 'Burma'? Haven't come across these anywhere. 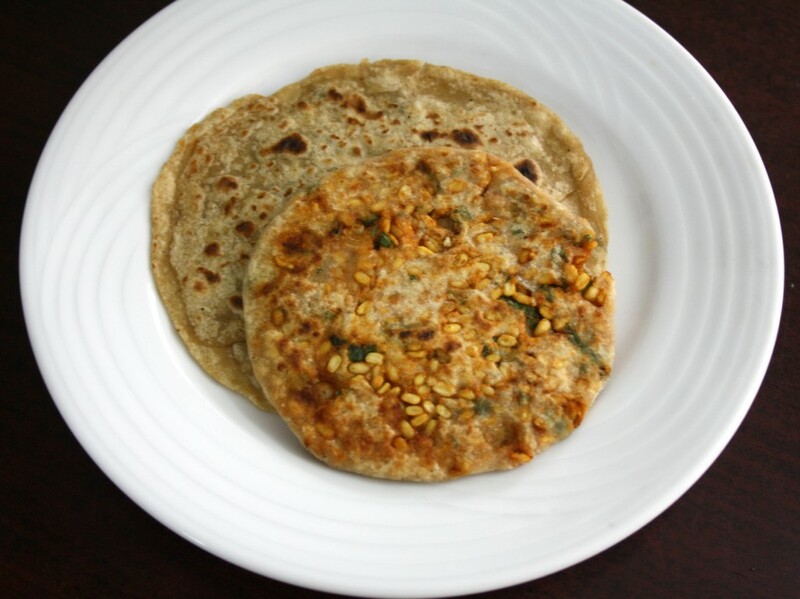 Valli, I tried earlier some other parathas like these, putting stuffing between 2 rotis and I wasn't satisfied with the way they came out after frying even after slow cooking. Do you think the inner side of the rotis cook well?